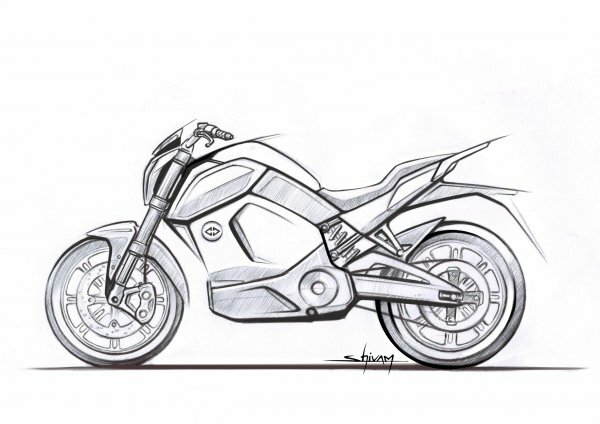 Revolt Intellicorp, headquartered in Gurgaon has revealed sketch of their upcoming smart-motorcycle. This will be India’s first AI-enabled motorcycle, and looks nothing like any other electric two-wheeler in the market. This smart motorcycle has been designed by Shivam Sharma, Chief Designer of Revolt Intellicorp. The fact that the vehicle is electric, doesn’t compromise on the performance, form factor or aesthetics of conventional ICE machines. A close look at the sketch shows that the vehicle has been designed keeping in mind the aerodynamics to ensure performance at par or over par when compared to an ICE as stated by the company in its press statement. The smart-motorcycle sports design language and features that are intrinsic to conventional two-wheeler enthusiasts and users. The evocative and bold design reflects the need of the new consumer- making urban commute convenient, cleaner and sustainable, adds the statement of the company. Revolt Intellicorp Pvt. Ltd. has a manufacturing facility in Manesar, Haryana. Its experienced R&D team based in Gurgaon headquarters and has been working for close to 2 years with a joint vision of introducing India’s first AI-enabled motorcycle without compromising on the performance or aesthetics. The new motorcycle by Revolt will debut in June, 2019.